"Frau Fiber, activist and textile worker, will mimic the expenditure of apparel production, reconstructing a white shirt and business suit originally produced offshore. A suit and shirt, the archetypal white-collar uniform, is an American icon, standing for quality, dependability and style, enhancing the wearer’s professional image. The remade garments will be available for purchase in the storefront, priced on a geographical sliding scale (hours worked to make the reconstructed garment multiplied by the wage scale in the original garment’s country of manufacture—China, Guatemala, Taiwan—equals KO’s cost of the uniform)." 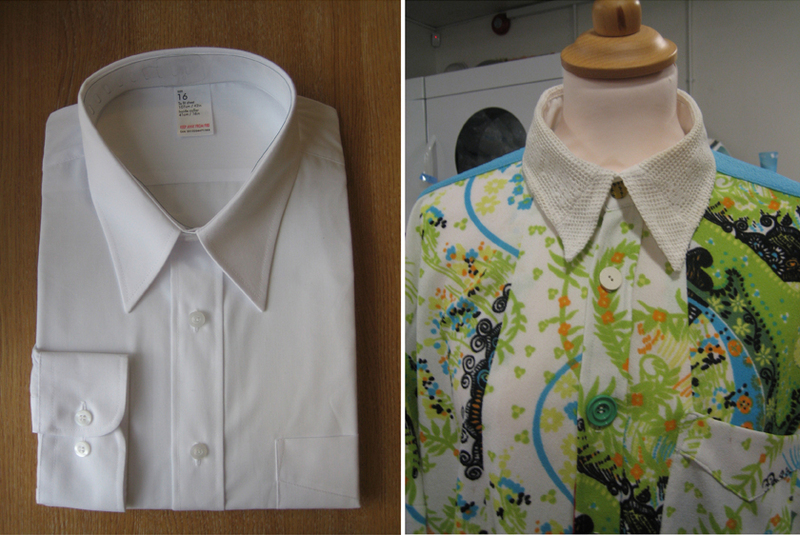 "Tescos’ White Collar Shirt, purchased for 4.50 euro; KO White Collar Shirt, assembled from recycled fancy dress."